Greg Davenport on Rag'n'Bone Man's Skin: "There’s nothing like spending a night in the middle of nowhere"
Greg Davenport has a knack for directing moving human dramas within distinctive, sometimes harsh settings. He's been doing it in music videos for Lonely The Brave, Steve Mason, Frightened Rabbit and others over the past four years. Now Rag'N'Bone Man's new single Skin has provided the inspiration for Davenport's most epic video - a compelling story told in a spectacular (and spectacularly harsh) backdrop. 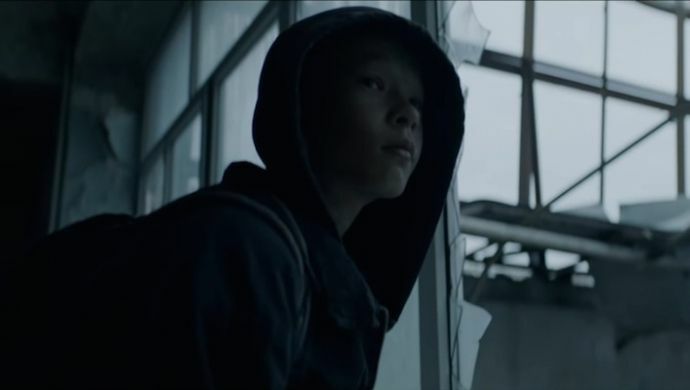 Davenport (above) and his crew - including DoP Pat Scola – travelled to Kazakhstan, in the farthest reaches of Europe, to shoot this heart-rending dystopian story of a boy wandering in a deserted world. And as he explains to Promonews, shooting in Kazakhstan provided the team with enormous challenges and also opportunities - including the unexpected one of having two actors playing the same role. BTS photography: Anna Laznya. Promonews: How did you come up with the idea for the Skin video? Greg Davenport: The ‘last kid on earth’ is an idea I’ve had in my mind for a while now and somehow it just worked with the lyrics and music of Skin in such a perfect and unexpected way. The original brief mentioned a desire for scale and cinematic expansiveness, as well the theme of ‘missed opportunities’ - so my idea was simply to take that to an epic place. And rather than focus on a romantic narrative to instead look to create something more universal. To see this kid in such impossibly huge landscapes, against the odds in a desperate search purely to find other people and not be alone. 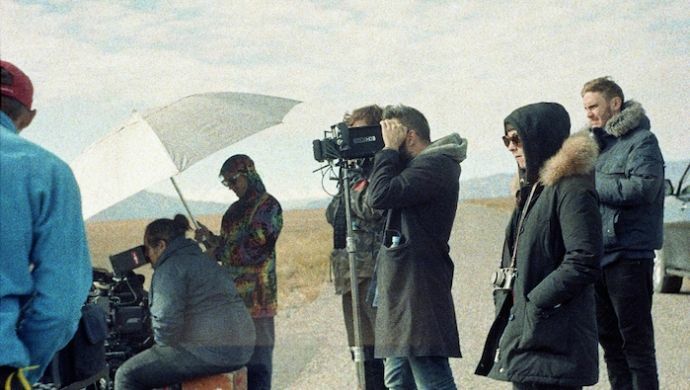 "Kazakhstan was perhaps an unexpected choice - it gave us the mix of expansive natural locations and abandoned/ruined spaces we needed"
You’ve shot in Central/Eastern Europe before. Did you have Kazakhstan in mind? What made it an excellent location? It had always been my intention to shoot in Kazakhstan and a lot of the images in my treatment came from there. The sheer epic scale and breadth of locations was truly inspirational and thankfully our producer and service companies did an incredible job to allow us to shoot there. As well as being a genuinely breathtaking place, I felt that Kazakhstan was perhaps a more unexpected choice and it gave us the perfect mix of expansive natural locations and abandoned/ruined spaces we required. I was also able to bring over some crew members from Kyiv, where I spend a lot of my time, who worked together with the incredible local crew to make it all possible. How did you find your talented young lead actor? Despite the fact that the talent pool in Almaty is fairly small and this was an incredibly tough brief, Nadine our casting director managed to bring us some good options. And luckily enough for us within those options were identical twins, Alibek and Alisher. The stuff of production dreams! The boys really excelled naturally with the physical stuff, running around the place like a couple of action heroes. And with such an ambitious and exhausting shoot for all of us, it really was key to be able to utilise the two boys at different times. "Luckily enough the casting options included identical twins, Alibek and Alisher. The stuff of production dreams!" What were the main challenges during the production and in particular on the shoot? 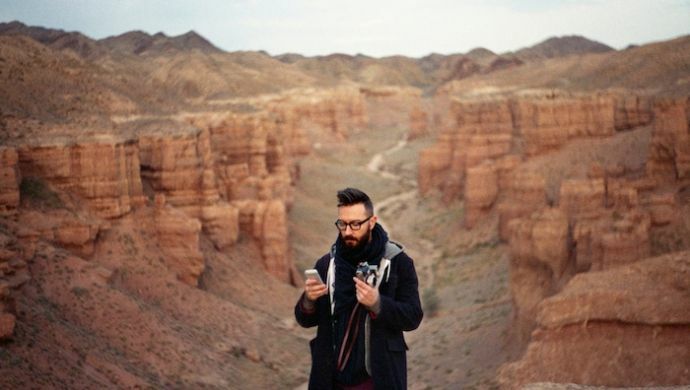 Kazakhstan is a huge country and the distances we travelled were eye-watering, that in itself is a challenge when it comes to scouting locations. I had a tough time cutting them down, with some intense late-night decision-making going on ahead of the shoot. On the shoot days themselves we kept crew size to a minimum but still travelling was a big, big deal, both in terms of distances and even the terrain itself. Navigating the canyon’s huge teetering boulders is certainly a memory I won’t forget in a hurry. It’s fair to say we faced some challenges with both our drone and the inclement weather, but these things happen. The local crew were fantastic and there’s nothing like spending a night in the middle of nowhere (some crew staying in yurts) to really bond everyone together. What equipment (camera, lighting, etc) did you use? Patrick Scola our cinematographer and I chose to shoot with the Alexa Mini and beautiful Arri master anamorphics. A lighter body was a gimme on this kind of shoot, enabling Pat to really get in close and move with our kid in those moments that demanded it, and allowing us to improvise too which was key. With large distances to cover and lots of locations to shoot the plan was never to be in one place too long. There’s no better light than the sun so apart from a little fire flicker in the final scene and some bounce along the way, that’s what you’re seeing. "The Alexa Mini enabled Pat Scola to get in close and move with our kid"
Rag'N'Bone Man appears at the start, singing Skin a capella. Was he on the shoot with you? He was! I didn’t think we’d be able to make it happen, but yes Rory came out to Almaty to perform the acapella for the opening. I was adamant that doing it for real and recording him singing live would be a huge benefit to us and I stand by that. The audience can tell the difference, and the feeling you get from it is more powerful and more engaging this way. His first take just blew us all away, and standing where we were it felt like a special thing to experience. Rory also remained on set with us until the very end of the day, if you look very closely you might just spot him during the end scene.